courtesy: marthastewart.com – that’s the Riesling next to the turkey! Thanksgiving is less than a week away, so obviously Martha is really busy right now. Home chefs across the country are turning to her as they slice, dice and prep their feasts. Hopefully, they’re all doing it with a glass of wine at their side, which is the best and funnest way to cook. If they’re following Martha’s lead, looks like we’ve got some grapefriend action happening! So I guess a lot of people brine turkeys, which is when you soak it overnight in a salty solution so that it gets really moist (apparently the salt actually changes the molecular structure of the meat). My mom never did this so it always sounded kind of gross to me. However, I didn’t realize you could add wine to this whole deal! 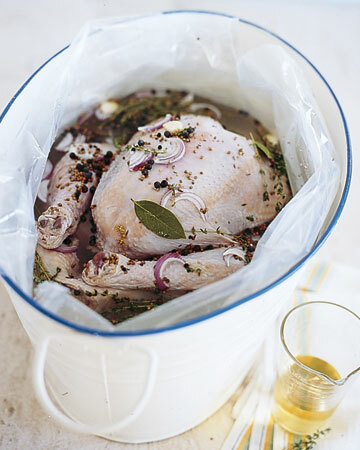 Martha says, “When you add aromatics to the brine, the resulting roast is also infused with a subtle character all its own.” And by aromatics she means a whole bottle of Riesling! Riesling is, after all, what’s known as an “aromatic varietal.” It has an amazing nose (some grapes don’t smell as much) of peaches and apricots. As it ages, it can take on a “petrol” smell (gas to you and me, but for some reason in the wine world everyone calls the scent petrol) – might sound yucky but it’s not. Plus, old Rieslings are SICK, SICK wines. Ugh, I want one right now. Anyway, when I was taking my Blind Tasting course, most people always identified Riesling easily because of its unique smell. Lots of people recommend Riesling as a good Thanksgiving wine. I think it would be fine if it’s a fuller, drier one. My recommendations are coming on Monday, but Martha’s drunken brining recipe could convince me to throw a Riesling on the table! Here’s Martha’s Riesling recipe – what do you think, Mom? Tags: martha stewart, recipe, riesling, thanksgiving. Bookmark the permalink.